The Unspeakable Loss: How Do You Live After a Child Dies? A guide to hope and healing after the death of a child, from a grief counselor and psychotherapist who has been there. Nisha Zenoff lost her son in a tragic accident when he was just seventeen years old. Now, with decades of experience as a grief counselor and psychotherapist, she offers support and guidance from her own journey and from others who have experienced the death of a child. The Unspeakable Loss helps those who mourn to face the urgent questions that accompany loss: "Will my tears ever stop?" "Who am I now without my child?" "How can I help my other children cope?" "I lost my only child, how do I live?" "Will my marriage survive?" "Will life ever feel worth living again?" No matter where you are in your grieving process, The Unspeakable Loss provides a space to mourn in your own way, and helps you understand how the death of a child affects siblings, other family members and friends, recognizing that we each grieve differently. And while there is no one prescription for healing, Zenoff provides tools to practice the important aspects of grieving that are easily forgotten--self-compassion and self-care. 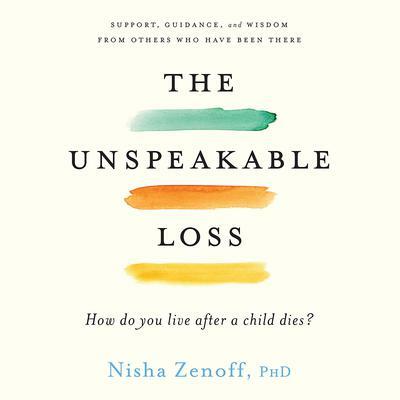 The Unspeakable Loss doesn't flinch from the reality or pain caused by the death of a child, yet ultimately it is a book about the choice to embrace life, love, and joy again. As Zenoff writes in the Preface: "Our relationships with our children do not end with their deaths. Our relationships change, they're transformed, but our children will always be with us." Nisha Zenoff lost her son in a tragic accident when he was just seventeen years old. Now, with decades of experience as a grief counselor and psychotherapist, she offers support and guidance from her own journey and from others who have experienced the death of a child. The Unspeakable Loss helps those who mourn to face the urgent questions that accompany loss: "Will my tears ever stop?" "Who am I now without my child?" "How can I help my other children cope?" "I lost my only child, how do I live?" "Will my marriage survive?" "Will life ever feel worth living again?" No matter where you are in your grieving process, The Unspeakable Loss provides a space to mourn in your own way, and helps you understand how the death of a child affects siblings, other family members and friends, recognizing that we each grieve differently. And while there is no one prescription for healing, Zenoff provides tools to practice the important aspects of grieving that are easily forgotten--self-compassion and self-care. 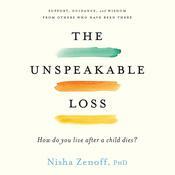 The Unspeakable Loss doesn't flinch from the reality or pain caused by the death of a child, yet ultimately it is a book about the choice to embrace life, love, and joy again. As Zenoff writes in the Preface: "Our relationships with our children do not end with their deaths. Our relationships change, they're transformed, but our children will always be with us."